Metal Site Furnishings | Petersen Manufacturing Co. Inc.
Petersen metal site furnishings are manufactured in Denison, Iowa, and have representation in every state, Canada, Puerto Rico, Hong Kong, and Mexico by authorized Petersen representatives. 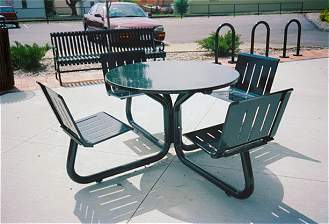 Metal site furnishings are available in various sizes, shapes and colors. Who uses metal site furnishings? Petersen metal site furnishings are frequently purchased by local, state, and federal government agencies, fast food restaurants, malls, shopping centers, schools, airports, parks and recreation departments, residential complexes, and many others including customers purchasing individual metal site furnishings to beautify their homes, patios, and gardens. Advantages of metal site furnishings? Petersen metal site furnishings offer maximum durability with minimum maintenance. The heavy gauge steel construction is manually sandblasted and then chemically phosphatized to accept the many colors of powder-coating available for selection on each of our metal site furnishings. metal site furnishings are a modern, yet classic, alternative to concrete and wood – without the weight of concrete and the upkeep of wood. 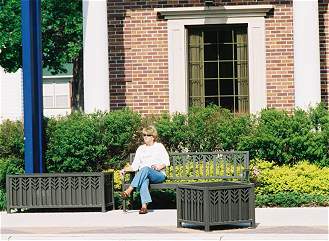 Metal Site Furnishings are weather resistant and may last a lifetime when cared for properly. Metal Site Furnishings are easy to clean and allow for the use of many chemicals that can not be used on other site furnishings. How soon will I have my metal site furnishings delivered? Petersen metal site furnishings come in a variety of designs, sizes, and colors and most are kept in stock – awaiting your powder-coating color choice. Once you decide on a Petersen steel planter and how many you need, Petersen Mfg. Co. will give you an estimated time for quick delivery. Where can I view CAD Drawings for Metal Site Furnishings? Please visit our CAD Drawing on-line using the link located on the top of this page. Contact a Petersen MFG. Representative today to discuss your project.